It’s that time of year again! For the next few days leading up to the New Year, we will have a series of ‘Year in Review’ articles, compiling and featuring the Royal highlights of 2018. It’s my birthday today, and since all birthdays should have Tiaras, today’s feature is a roundup of the Royal Tiaras of 2018! Each Year, there is a Royal lady that has had more notable Tiara appearances than the others, and after Queen Mathilde in 2016, and Queen Letizia in 2017, Queen Máxima of The Netherlands wins the title in 2018, with six Tiara events this year, despite missing three more on the State Visits to the Baltic States, which she pulled out of due to her sister’s suicide, and the lack of the traditional Guildhall Banquet on the State Visit to Britain. The Tiara appearences of other Queens include 3 for Queen Elizabeth II (all the same), 2 for Queen Letizia of Spain (both debuts, meaning she has now worn all the Tiaras to which she had access), 2 for Queen Sonja of Noway (including one worn after a long time), 4 for Queen Margrethe of Denmark (all different), 6 for Queen Silvia of Sweden (five different tiaras), 6 for Queen Mathilde of Belgium (mostly her Laurel Wreath), and 3 for Grand Duchess Maria Theresa of Luxembourg (with one notable appearance not in her usual favourite). There was also a plethora of Tiara debuts and reappearances, most notably on Queen Maxima, Queen Letizia, the Duchess of Sussex, Princess Eugenie, and a lot of non-reigning Royal and Noble brides. In addition to all the Tiara events, we have featured articles on dozens of royal jewels throughout the year, which you can visit HERE! The first Royal Tiaras of 2018 came before much of the world had even seen the New Year, when the Japanese Imperial Family hosted their annual Ceremony of New Year’s Celebration at the Imperial Palace in Tokyo on January 1st. While Empress Michiko didn’t wear a Tiara, Crown Princess Masako wore the Pearl Sunburst Tiara, Princess Kiko wore her Wedding Tiara, Princess Mako wore her 20th Birthday Tiara, and the extended members of the Imperial Family wore their Personal Tiaras. The same evening in Copenhagen, the Danish Royal family attended the annual New Year’s Court (Nytårskur) and Banquet hosted by Queen Margrethe at Christian VII’s Palace, at which Queen Margrethe wore the Danish Emerald Parure, Crown Princess Mary debuted a new configuration of the Ruby Parure Tiara, and Princess Marie wore the Dagmar Floral Tiara. Later in the month, the Swedish Royal Family hosted the Icelandic State Visit to Sweden, with Queen Silvia wearing the Leuchtenberg Sapphire Parure and Princess Sofia wearing the Diamond version of her Wedding Tiara. The next Tiara came in March, when Queen Mathilde wore her Laurel Wreath Tiara for the State Banquet hosted by Governor General Julie Payette on Day 1 of the Belgian State Visit to Canada. Days later, Alessandra de Osma wore the Hanoverian Floral Tiara at her Wedding of Prince Christian of Hanover in Lima, Peru, which had also been worn by her sister-in-law at her wedding last year. Not a Tiara Appearance, but Queen Victoria’s Emerald Tiara, the Fife Tiara, and the Fife Fringe Tiara went on display at the Victoria Revealed Exhibition at Kensington Palace until 2020, with the Emerald and Fringe Tiaras on loan from the Duke of Fife, while the magnificent Fife Tiara was been accepted in lieu of Inheritance Taxes. In April, King Felipe and Queen Letizia of Spain hosted President Rebelo de Sousa of Portugal, and the Queen wore the Cartier Diamond and Pearl Tiara for the first time at the State Banquet. A few days later, the Queen hosted the biannual Commonwealth Heads of Government Meeting (CHOGM) Dinner at Buckingham Palace, wearing her Girls of Great Britain & Ireland Tiara and the Greville Ruby and Diamond Floral Bandeau Necklace, the Duchess of Cornwall wore the Greville Tiara, the Princess Royal wore her Festoon Tiara, the Countess of Wessex wore her Aquamarine Necklace Tiara, the Duchess of Gloucester wore the Iveagh Tiara), Princess Alexandra wore her Ogilvy Tiara, and Princess Michael of Kent wore the Kent City of London Fringe Tiara. At the annual Gala Dinner for the Diplomatic Corps at the Royal Palace of Amsterdam, Queen Máxima wore the Aquamarine Tiara, Princess Beatrix wore Queen Emma’s Diamond Tiara, and Princess Margriet wore the Pearl Button Tiara. A few days afterwards, the Dutch Royal Court released a series of new portraits to mark King Willem-Alexander’s 5th Anniversary of Accession and his 51st Birthday, including an Official Portrait, in which Queen Máxima wore the Dutch Sapphire Tiara. In May, various Danish Royal jewels and tiaras went on display at the ‘Magtens Smykker’ exhibition in Koldinghus, including the Khedive of Egypt Tiara, Nassut Tiara, Midnight Tiara, Princess Benedikte’s Floral Tiara, Queen Sophia’s Star and Pearl Tiara, the Order of the Elephant, Order of Dannebrog, and Queen Margrethe II’s Royal Family Order. The Bourbon Parma / Lobkowicz Tiara was put on Auction at the Sotheby’s Magnificent Jewels and Noble Jewels Sale, which was bought by Prince Charles Henri de Lobkowicz and has returned to the family! Then, Meghan Markle wore Queen Mary’s Diamond Bandeau on loan from the Queen at her Wedding to Prince Harry at St. George’s Chapel, Windsor Castle, the first time the Tiara had been seen in over 65 years. Days later, at the Dutch State Banquet in Luxembourg, Queen Máxima wore the smaller version of the Stuart Tiara, seen for the first time in over 40 years, Grand Duchess Maria Theresa wore the Belgian Scroll Tiara, and Hereditary Grand Duchess Stephanie wore the Chaumet Pearl and Diamond Choker Tiara. Crown Prince Frederik’s 50th Birthday Gala Dinner at Christiansborg Palace was the most glittering royal event of the year, with Queen Margrethe wearing the Nassut Tiara, Crown Princess Mary in her Necklace Tiara, Princess Marie in the Dagmar Diamond Floral Tiara, the Countess of Frederiksborg wearing the Alexandrine Drop Tiara, Queen Anne Marie in Khedive of Egypt Tiara, Crown Princess Marie-Chantal wearing a Diamond Bracelet Tiara, Princess Maria-Olympia in the Miller Fringe Tiara, Princess Theodora wearing the Antique Corsage Tiara, Princess Benedikte in the Sayn-Wittgenstein-Berleburg Fringe Tiara, Princess Alexandra zu Sayn-Wittgenstein-Berleburg wearing Princess Benedikte’s Floral Tiara), Count Ingolf and Countess Sussie of Rosenborg in Queen Alexandrine’s Fringe Tiara, Queen Silvia in the King Edward VII Ruby Tiara, Crown Princess Victoria wearing the Baden Fringe Tiara, Crown Princess Mette Marit in the Diamond Daisy Bandeau, Queen Máxima wearing the Rose Cut Diamond Bandeau, Queen Mathilde in the Laurel Wreath Tiara, Grand Duchess Maria Theresa wearing the Chaumet Pearl and Diamond Choker Tiara, Hereditary Princess Sophie in the Hapsburg Fringe Tiara, and Duchess of Castro wearing the Ancona Tiara. Also in May, the Swedish Royal Family hosted their Representationsmiddag (Representatives Dinner) at the Royal Palace of Stockholm, at which Queen Silvia wore the Connaught Diamond Tiara, Crown Princess Victoria wore the Baden Fringe Tiara, and Princess Sofia wore her Wedding Tiara. At the Banquet for the Slovakia State Visit to Norway, Queen Sonja wore Queen Maud’s Pearl Tiara, Crown Princess Mette-Marit wore her Amethyst Necklace Tiara, and Princess Astrid wore her Aigrette Tiara. At the Luxembourg National Day Gala, Grand Duchess Maria Teresa wore the Belgian Scroll Tiara, Hereditary Grand Duke Stéphanie wore the Turquoise Tiara and Parure, Princess Claire wore the Grand Duchess Adélaïde Tiara, and Princess Alexandra wore the Aquamarine Bandeau Tiara. Celia McCorquodale, daughter of Lady Sarah McCorquodale, wore the Spencer Tiara, worn for the first time since the death of Diana, Princess of Wales, at her Wedding to George Woodhouse at St Andrew and St Mary’s Church in Stoke Rochford, Lincolnshire. For the State Banquet in honour of Australian Governor General Sir Peter and Lady Cosgrove at the Royal Castle of Laeken, Queen Mathilde wore the Wolfers Necklace Tiara. The Sultan of Brunei’s 72nd Birthday celebrations in July had a variety of glittering events, with Queen Saleha wearing her new Diamond Tiara all day. For her second wedding at the Lyngby Kirke, Countess Camilla of Rosenborg wore the Rosenborg Spike Tiara. At the State Banquet in honour of French President Emmanuel Macron and First Lady Brigitte Macron, Queen Margrethe wore the Pearl Poiré Tiara, Crown Princess Mary wore the Ruby Parure Tiara, Princess Marie wore the new Mauboussin Nuit Claire/Lyse Naetter Tiara, and Princess Benedikte wore the Sayn-Wittgenstein-Berleburg Fringe Tiara. Countess Anna Theresa von und zu Arco-Zinneberg wore the Savoy-Aosta Tiara, on loan from her uncle, at her wedding to Colin McKenzie at Niederaltaich Abbey in Bavaria. Princess Eugenie gave a big surprise when she wore the Greville Emerald Kokoshnik Tiara at her Wedding to Jack Brooksbank at St. George’s Chapel, Windsor Castle, seen after more than 80 years and worn for the first time by a member of the Royal Family. The Wedding of Duchess Sophie of Württemberg and Count Maximilien d’Andigné brought a lot of Tiaras, with the bride wearing the traditional Württemberg ‘Small’ Diamond Tiara, and at the grand Wedding Ball wore Duchess Marie Caroline wore the Württemberg Ruby Tiara, the Princess of Waldbourg Zeil wore the original Cambridge Lover’s Knot Tiara, Hereditary Princess Sophie of Liechtenstein wore the Hapsburg Fringe Tiara, Duchess Marie of Württemberg wore the Diamond Necklace Tiara, Duchess Elizabeth of Bavaria wore the Bavarian Pearl and Diamond Floral Tiara, and Landgravine Flora of Hesse wore the Hesse Ears of Wheat Tiara. For the State Banquet during the Belgian State Visit to Portugal, Queen Mathilde wore her Laurel Wreath Tiara, while the Duchess of Braganza wore her Floral Necklace Tiara and Duchess of Cadaval wore her Wedding Tiara. At the long-awaited Dutch State Banquet at Buckingham Palace, the Queen wore her Girls of Great Britain & Ireland Tiara and the rare Cullinan III & IV Brooch, Queen Máxima wore the Stuart Tiara (with the Stuart Diamond for the first time since 1972), the Duchess of Cornwall wore the Greville Tiara, the Duchess of Cambridge wore Queen Mary’s Lover’s Knot Tiara, and Queen Alexandra’s Wedding Necklace, Princess Mabel wore the Dutch Sapphire Necklace Tiara, the Princess Royal wore Princess Andrew’s Meander Tiara, the Countess of Wessex wore her Five Aquamarine Tiara, the Duchess of Gloucester wore the Cartier Indian Tiara, Princess Michael of Kent wore the Kent Festoon Tiara and Lady Elizabeth Anson wore Princess Viggo’s Diamond Tiara. The following day, at the Banquet and Ball at Christiansborg Palace for members of the Danish Government, Folketing, and Danish members of the European Parliament, Queen Margrethe wore the Floral Aigrette Tiara, Crown Princess Mary wore her Wedding Tiara (worn for the first time sine 2015), Princess Marie wore her Dagmar Diamond Floral Tiara, and Princess Benedikte wore her Floral Tiara. A day later, at the annual Gala Dinner for Members of the Norwegian Parliament (Stortingsmiddag) at the Royal Palace of Oslo, Queen Sonja wore Queen Josefina’s Diamond Tiara (for the first time since 2012), Crown Princess Mette-Marit wore the Amethyst Necklace Tiara and Parure, and Princess Astrid wore her Vasa Tiara. 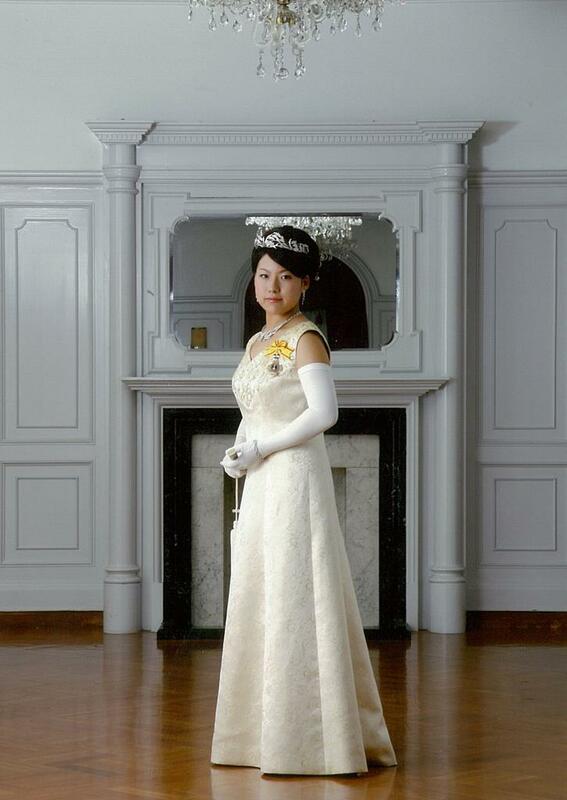 The following day, Princess Ayako of Takamado wore her 20th Birthday Tiara and Parure for the last time at her Farewell Audience (Choken-no-Gi) with Emperor Akihito and Empress Michiko of Japan at the Imperial Palace of Tokyo. She wore her mother’s diamond riviere necklace as a Tiara at the Wedding Reception. October was also full of events to mark the Coronation of the Sultan of Kedah in Malaysia, with a plethora of glittering royal guests, including Crown Princess Sarah of Brunei in her Wedding Tiara and Queen Saleha in her Diamond Heart Tiara. In New Official Portraits released to mark the 5th Anniversary of King Philippe’s accession, Queen Mathilde wore the full version of the Nine Provinces Tiara for the only time this year. Possibly the biggest Royal Auction of the decade, the Royal Jewels from the Bourbon Parma Family Sale at Sotheby’s in Geneva featured one of the largest and historic royal collections to be auctioned in recent years, with a plethora of stunning jewels. At the annual Peter Stuyvesant Ball in New York City, Princess Margriet of the Netherlands wore the base of the Antique Pearl Tiara. Two days later, Queen Mathilde wore the Base of the Nine Provinces Tiara for the State Banquet in honour of French President Emmanuel Macron and First Lady Brigitte Macron, while Princess Astrid wore the Savoy-Aosta Tiara) and Princess Claire was present in her Pearl and Diamond Tiara. At the State Banquet in honour of the Singapore State Visit to The Netherlands, Queen Máxima wore the Ruby Peacock Tiara, Princess Beatrix wore Queen Emma’s Diamond Tiara, Princess Laurentien wore the Dutch Aquamarine Tiara, and Princess Margriet wore the Dutch Emerald Tiara. Then some sad Tiara News, the historic Portland Tiara was stolen from the Welbeck Abbey Estate, and while there have been various leads since then, it still remains missing. Queen Letizia wore Queen Maria Christina’s Cartier Loop Tiara at the State Banquet in honour of President of the People’s Republic of China, Xi Jinping, and First Lady Peng Liyuan, making it her second Tiara debut of the year and crossing out the last tiara on her list. Also in November was the Auction of Queen Alexandrine’s Russian Sapphire Tiara from the collections of Countess Josephine, Countess Camilla, Countess Feodora of Rosenborg, which sold for DKK 2 million. While we did get surprise pictures from the Diplomatic Reception at Buckingham Palace this year, the Tiaras were predictable, with the Queen wearing her Girls of Great Britain & Ireland Tiara, the Duchess of Cornwall in the Greville Tiara, and the Duchess of Cambridge wearing Queen Mary’s Lover’s Knot Tiara. At the State Banquet in honour of the Cape Verde State Visit to The Netherlands, Queen Máxima wore the Dutch Diamond Bandeau, earrings from the Stuart Tiara, and Queen Emma’s devant de corsage for the first time, while Princess Beatrix wore the Antique Pearl Tiara). There were more predictable Tiaras at the annual Nobel Prize Ceremony and Banquet in Stockholm, with Queen Silvia in Queen Sofia’s 9-Prong Tiara, Crown Princess Victoria wearing the Connaught Diamond Tiara, Princess Sofia wore the Pearl Version of her Wedding Tiara, and Princess Christina in Six-Button Tiara. At the King’s Dinner for Nobel Laureates the following evening, Queen Silvia wore the Baden Fringe Tiara, Crown Princess Victoria wore her Laurel Wreath Tiara, Princess Sofia wore her Wedding Tiara, and Princess Christina wore the Six-Button Tiara.